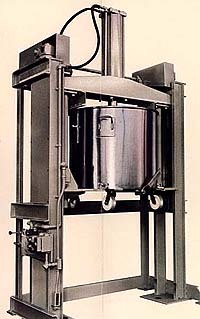 Elevated Discharge Systems from Charles Ross and Son Company are available to raise the mix can above the floor to provide clearance for a drum or other receiver below the valve of the mix can. Discharge systems are also available for feeding the discharged product to filling or packaging equipment, extruders, two and three roll mills as well as conveying the product to another downstream process. To operate the discharge system, the operator places the mix can with mixed product under the platen and then lowers the hydraulically actuated piston into the mix can, forcing the product, either through a side or bottom discharge valve, or up through the top of the platen.